We think learning to drive should be fun and stress free. We've seen time and time again nerves and fear holding back a students progress. Creating a learning environment like this starts with us and our instructors. Our driving instructors are trained beyond the normal requirements to ensure you get only the best. As a student you are only as good as the training you receive and that training has to be catered to your individual needs. Our instructors passion for driving is infectious and aimed at one thing. You, our student, and your safe development into a competent driver. No other Curraha Driving Schools offer free material like ours. With our free home study support material you'll be prepared for every lesson and develop faster as a driver than with any other driving school. Covering vital driving skills like driving at night, road positioning and traffic progression this training is like having your own driving instructor with you 24/7. We all remember the fun engaging teacher at school that made learning fun and easy. And then we had the opposite, those teachers that had no place in the classroom. Not all teachers are made equal and that is no less real with approved driving instructors. It's not as straightforward as Googling 'Driving Lessons Curraha' and choosing the first driving school you see. Who can you believe in to give you that enjoyable and engaging experience? 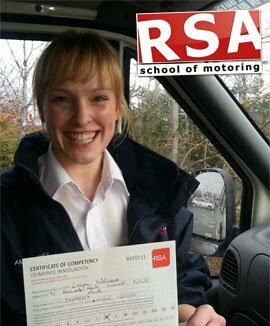 We now have helped countless learners pass the test so before you carry on your search we urge you to consider RSA School of Motoring for your driving lessons in Curraha. Read on to understand why. First you must master the rules of the road, the road signs and skills involved to control a car safely. And then there is learning to pass the driving test. Being allowed to drive by yourself on Curraha roads is a freedom you must earn and the driving test is your chance to do it. As with any exam you have ever had to sit, 80% of passing the driving test is accomplished long before the day of the test with proper preparation. We wouldn’t be Curraha’s leading driving school if we didn’t. We can offer all our students driving lessons in automatic or manual dual controlled vehicles anywhere in Curraha. Give us a call to find out more. Do you want to do your Curraha driving lessons with a lady instructor? We can help. You can take your essential driver training or pretest lessons with one of our female driving instructors. Just give us a call to book in. We want your driving lessons to be convenient and easy to do. That is why our driving instructors will pick you up and drop you off from your chosen Curraha locations*, be it work, home or college. Got anymore questions for us? Our Curraha driving instructors would be proud to teach you to drive so call us today. You'll be very glad you did.